For those who follow a Celtic pagan path February 2nd brings Imbolc to celebrate the Goddesses transformation from crone to maiden; the change from dark to light. During this time we honor the beloved Brigid, goddess of healing and medicine, poetry, divination, fire (the forge and the hearth), knowledge and inspiration. She is daughter of Dagda, the great “father god” of Ireland and one of the oldest Goddesses still worshiped today. Also coinciding on this same day is the Scandinavian celebration called Disting, a holy day largely characterized by preparing the land for planting and the blessing of objects and tools. In Nordic mythology, within Vanaheim, home of the Vanir Gods and Goddesses, the largest stretch of woods is called the Barri Woods. It is said that within this magical grove of golden leaved trees, Frey (God of fertility) met with his etin-bride Gerda (Frost Giant) and wooed her. Many scholars interpret this symbolic marriage as a legend of the frozen Earth being wooed by the warming sun, thus creating the union of Spring. February 2nd marks new beginnings. In much the same manner that goats, sheep, deer and cattle are heavy with pregnancy and beginning to lactate and seed embryo lie protected within the Earth’s womb awaiting the (re)birth of spring. This same gestational awakening calls to us all to slowly rise back into action detailing the small tasks that we have neglected over the cold, dark winter. This is also a time for cleansing and purification both on mundane and spiritual levels, which are often completed simultaneously without one’s conscious intent. For more often than not, our actions in our outer lives mirror that of our inner lives. One example of this is in spring cleaning, which prepares our mind and body for resurgence. As we sort, rid and/or refurbish our physical belongings, so we do with our thoughts, attitudes and beliefs. 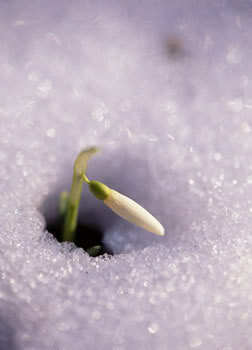 May your own reawakening nurture the seeds of hope, happiness and prosperity.